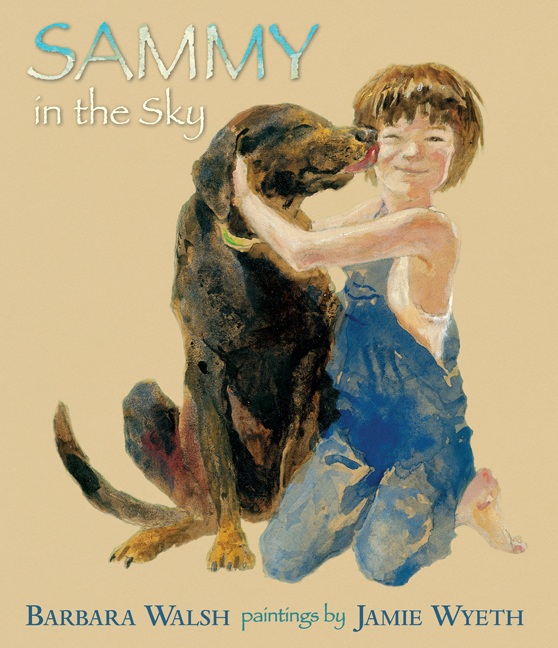 "Sammy in the Sky," a children’s book by Barbara Walsh, illustrated by Jamie Wyeth. 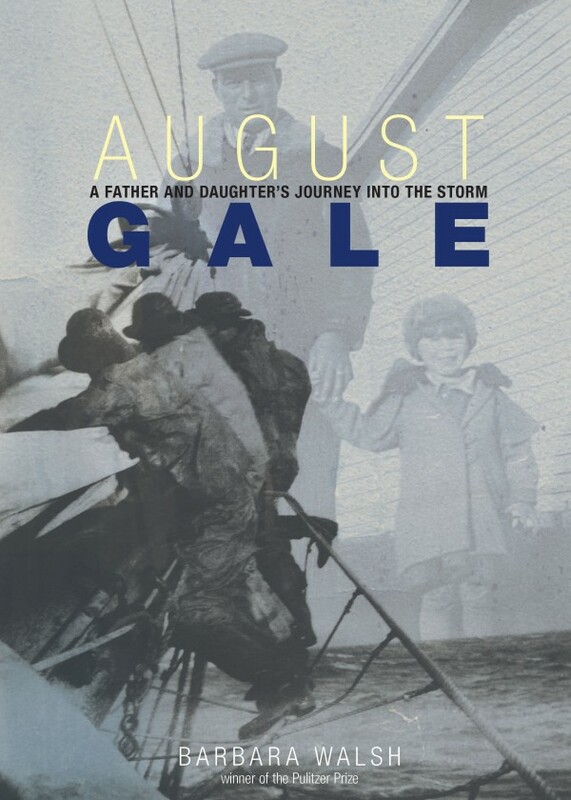 "August Gale: A Father and Daughter’s Journey into the Storm," by Barbara Walsh. 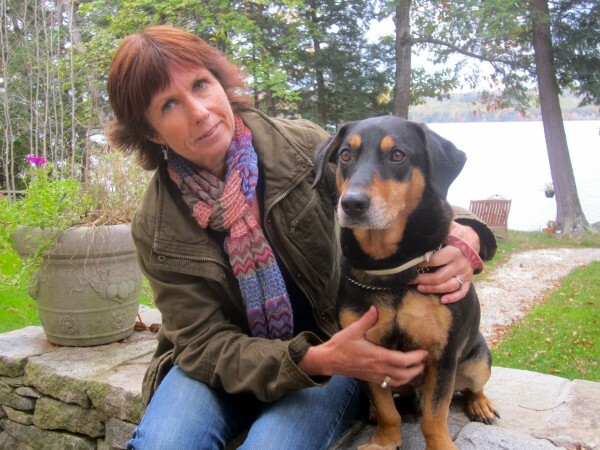 Barbara and her dog, Jack, at her home in Winthrop, Maine. 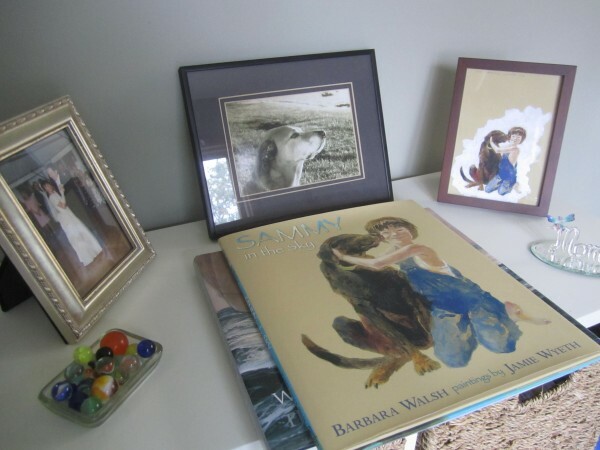 A table top in Barbara Walsh’s home office holds a “Sammy in the Sky” book and a photo of the original old hound dog, Sammy. When I first chatted with Barbara Walsh by phone, I was both charmed and energized. One might expect intensity from a Pulitzer Prize-winning journalist, and no doubt there is a high-octane force in her conversation. But there is also something else — a genuine, comforting compassion that draws you gently into Barbara’s circle of attention. It is that compelling combination of gale force and caring embrace that makes both Barbara and her new book particularly outstanding. “August Gale: A Father and Daughter’s Journey into the Storm” officially was launched Oct. 21 in Portland. Barbara is a career journalist, a veteran interviewer who tackles the toughest kinds of story. The Pulitzer is only one of many awards on Barbara’s resume. Nevertheless, writing “August Gale” was one of her toughest jobs to date. For the first time, the subject of her story was intensely personal. I learned a bit about the odyssey of writing “August Gale” one recent afternoon in Winthrop, where Barbara lives on Maranacook Lake with her husband and two daughters. The book project began with Barbara’s research into an epic storm, an “August gale” that hit Newfoundland in 1935, devastating the small fishing community of Marystown. Several of Barbara’s paternal ancestors were among those who perished. But there was a second story that would not leave Barbara alone. Ambrose Walsh, Barbara’s grandfather, grew up in Marystown but left for Boston several years before the gale. He married and had two sons. When his older son, Barbara’s father, Ron, was 11 years old, Ambrose deserted his family. Later they reunited for a while, then he left them a second time. Fourteen-year-old Ron never saw his father again. As hard as Barbara tried to set it aside, the untold story of her father’s childhood abandonment seemed inextricably entwined with the August gale. Ron Walsh was deeply hurt by his father’s betrayal. Bitterness did not consume him, however, thanks to the loving support of his extraordinary mother. Ron grew to be a good man and a loving, happy father. One of Ron’s six daughters, Barbara, began to write when she was quite young. Her dad encouraged her to persevere in her writing, even when she failed a college journalism class after missing a deadline. When Barbara’s writing led her to a place that pried at the locked doors of Ron’s past, he could have held fast. But Ron gradually opened up his family history at the gentle nudging of his daughter. The result was the unfurling of a breathtaking sea story, a crack in the door toward healing family bitterness, and an unforgettable book that weds the two tales together. Unbeknownst to Barbara, she already had begun to bridge a connection to her estranged grandfather when she was a teenager. In high school, Barbara wrote an essay about her relationship with her grandmother. “She was like my hero,” Barbara said. Though Barbara’s dad closed his heart to his wayward father, her grandmother kept communications open. “My Nana forgave him,” Barbara said. She sent reports of her sons and grandchildren to her ex-husband, Ambrose, including Barbara’s essay. Ambrose knew about Barbara’s writing; he expressed pride in her accomplishments. Yet the two never met. As Barbara wrote “August Gale,” she learned a bit about the mystery that was her grandfather. A part of her felt she never could forgive him, but another wished she could have known him. She learned about the unprecedented agony that he felt upon reading the report of his lost Marystown relatives in a newspaper headline. 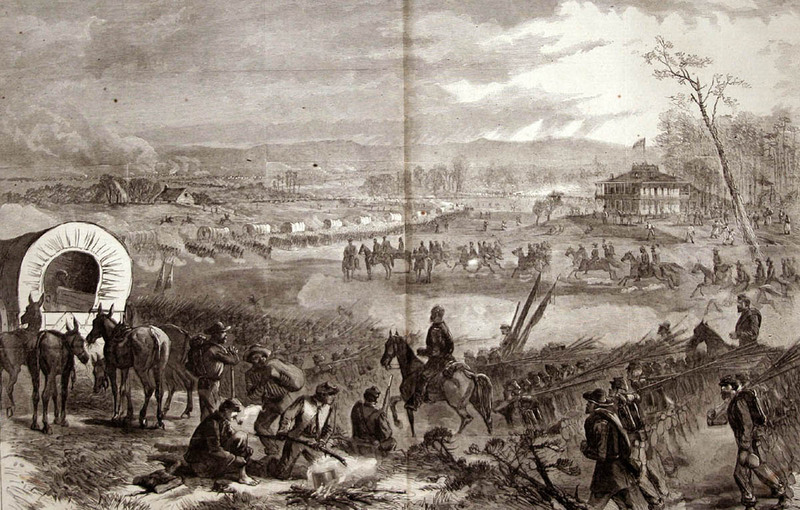 The scene of Ambrose’s tragic realization became the opening of her book. Researching and writing the book moved her forward towards a relationship with Ambrose. “Even though my grandfather is dead, I feel like I found him,” she said. In some ways, Barbara said, writing “August Gale” wasn’t so different from her previous writing. She did research and interviews; she told a story. The hard part was that she was telling the story of people she loved. The killer storm that wracked the village of Marystown may have been less emotionally taxing for Barbara as a writer, but those sections of the book are heart-stopping for the reader. Barbara is a relentless pursuer of detail. For a year, she hounded fishermen, museum curators and weather experts with questions to make sure her details were authentic. At one point she inadvertently had her Great Uncle Paddy sailing to Africa. In all of her writing, Barbara tells me, she is committed to telling stories “truthfully, honestly and accurately.” More than that, though, she holds a passionate conviction that the telling of stories can help people and change lives. As a journalist, she influenced change in flawed court systems, helped grieving families and brought needed attention to disenfranchised teens. In her newest book, the lives she changed are her family’s and her own. CALL FOR STORIES — Do you have any “Thanksgiving in Maine” stories or special traditions? Send them in to Robin for possible inclusion in a special edition Thanksgiving column on Nov. 18. Send to 20 Summer St., Hampden, ME 04444, or email: robin.everyday@gmail.com.